28885 Yellow Fin Trl, Bonita Springs, FL.| MLS# 219005680 | Southwest Florida Residential Real Estate for Sale. GORGEOUS Divosta built, concrete pouted Oakmont on a large corner lot! This home has it all, beginning w/the private location in VW. Spacious, bright & open - ONE of a kind! 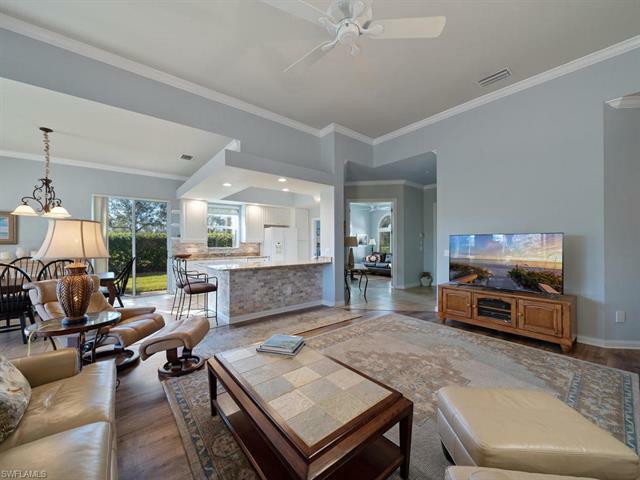 Recently updated - new kitchen w/granite counter-tops, white cabinets, fresh paint & completely open to the magnificent great room/dining area. The extended lanai is one of a kind. Decorative pavers & spa add to the uniqueness of this most inviting space. Whether enjoying outdoor meals, morning coffee or sunset cocktails, this will be your winter retreat. With a view of the lake & the eagle in the tree just across the way, you will appreciate every moment! On to the MBR, en suite bath, & his/hers walk in closets, all with luxury flooring. The 2nd & 3rd bedrooms are also spacious, split from the main living area. There's so much more --a charming foyer, roomy den and dedicated laundry area! HUGE garage where you can keep your cars & your treasured FL toys! Let's not forget location!! CLOSE to beaches, dining & intl airport. VW is one of the most active communities in SWFL! Tennis, Olympic size pool, on site restaurant, manned guard gate, full time activities director & MUCH more! Newer AC/HWH/washer/dryer!